If you’ve ever watched an episode of “Holmes on Homes” – the HGTV show where a licensed contractor goes in and fixes major construction problems for helpless homeowners who got swindled – you might start to get an idea how important proper ventilation is in a home. There was one home featured in the show that was completely infested with black mold behind the walls. It was at the point where several of the family members were sick and had no idea why. How did the black mold get there? The bottom line is improper ventilation. Most homes and commercial buildings in North America are built using wood-frame design and techniques. 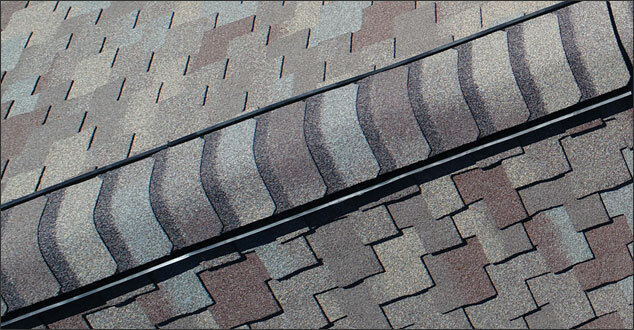 Most of them have steep-sided asphalt roofing, which results in an enclosed attic space. Whether or not you can live in your attic, you probably have one. The access point may be somewhere in one of your closets. So many things depend upon this “unused” space working the way it’s supposed to. The fact is it’s not really “unused.” Even if you don’t store anything there, it is the main place your home’s warm air goes. How that warm air gets used can affect your heating bills, your refrigerator’s productivity, and the health of your entire family, just to name a few things. Proper ventilation relies upon how air naturally “stacks” in an enclosed space. Warm air rises faster, creating a natural upward pressure. Appropriate attic ventilation includes exhaust outlets near the top of the roof to let out the hottest air and intake panels, usually under the eaves, to let in cooler air. This creates a cycling system that – along with proper insulation – allows your roof, attic, and home to stay at a stable temperature. What Happens With No Attic Ventilation? Summer – Sunshine causes a massive heat buildup in an attic space. It could reach 140 degrees in an unventilated attic on a 90-degree day. If there is any moisture – which there always is in Michigan – your roof decking and shingles can quickly become warped and prematurely age. It also radiates down into the living space, causing air conditioners and other appliances to have to work harder. Winter – In a cold attic, warm moist air rising from underneath will condense on the cold rafters. Condensation will cause the decking and shingles to swell and buckle. It will rot the roof deck, seep through and ruin insulation, leak into your house, cause wood rot, mold, and mildew. Outside, the formation of ice dams is much more likely. Warm air from underneath melts the under a layer of snow and it re-freezes, over and over. This eventually builds up in your gutters and backs up underneath your shingles and fascia. In addition, it can soak roof decking, peel paint, damage exterior and interior walls, ruin ceilings, and much, much more. Because of this, the International Code Council (ICC) and the U.S. Department of Housing and Urban Development (HUD) have set a code standard for roof ventilation. Any new homes that are built to code have to have ventilation. It’s the best way to ensure your home’s longevity and to keep insurance costs down. The standard is 1 square foot of net-free ventilation area for every 150 square feet of attic floor space. Most shingle manufacturers also use this standard as the minimum requirement for shingle warranties. If you don’t have proper attic ventilation, that’s the first thing to address before replacing your roof. A competent and experienced roofing company can come and see if you have what you need and make recommendations for how to fix it if not.